Savannah, Georgia is a city filled with history. 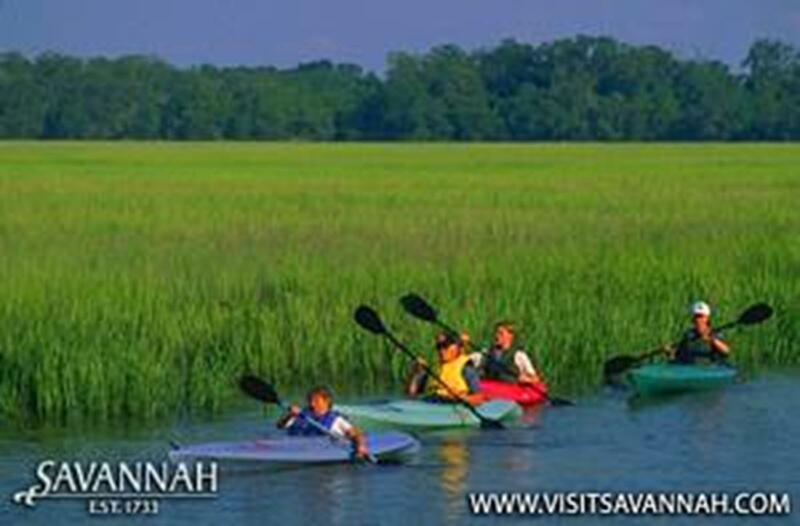 Founded in 1733 by James Oglethorpe, Savannah sits on the Savannah River 16 miles from the Atlantic Ocean. It contains the largest port in Georgia and largest National Historic Landmark District in the country. Savannah’s historic neighborhoods are famous around the world, featuring more than 45 historic inns, more than eight styles of architecture and more than 50 tour companies able to accommodate religious group travel. In addition to history, Savannah has an unparalleled reputation for Southern hospitality, evident in its nickname: “Hostess of the South.” Due to its history, beauty and Southern charm, religious groups will find no lack of educational and enjoyable activities on a tour of Savannah. Among Savannah’s collection of historic architecture are 15 churches that are ideal attractions for religious groups. 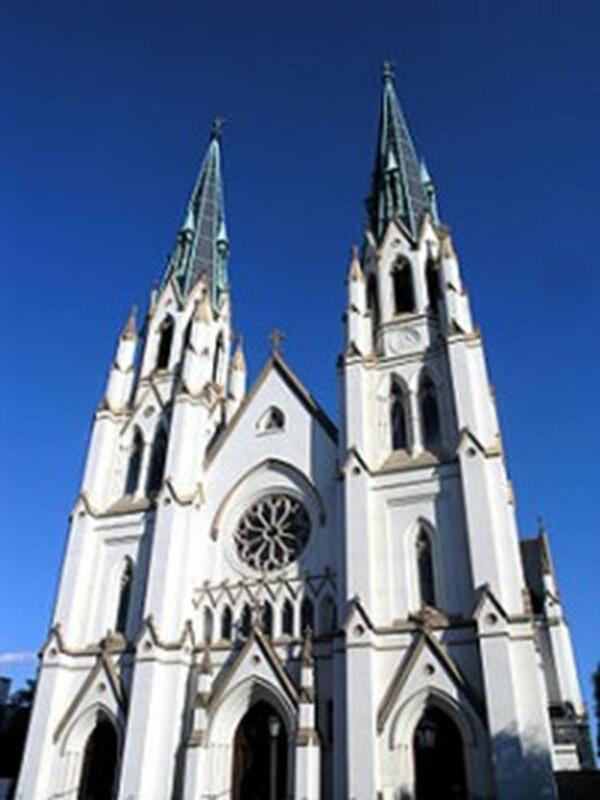 The Cathedral of Saint John the Baptist is fashioned in the Victorian Gothic style. Built in the 1870s under the name Our Lady of Perpetual Help, the church was destroyed by fire in 1898. It was immediately rebuilt following the original plans and rededicated in 1900 as the Cathedral of Saint John the Baptist. Highlights include breathtaking stained-glass windows, murals and spires. 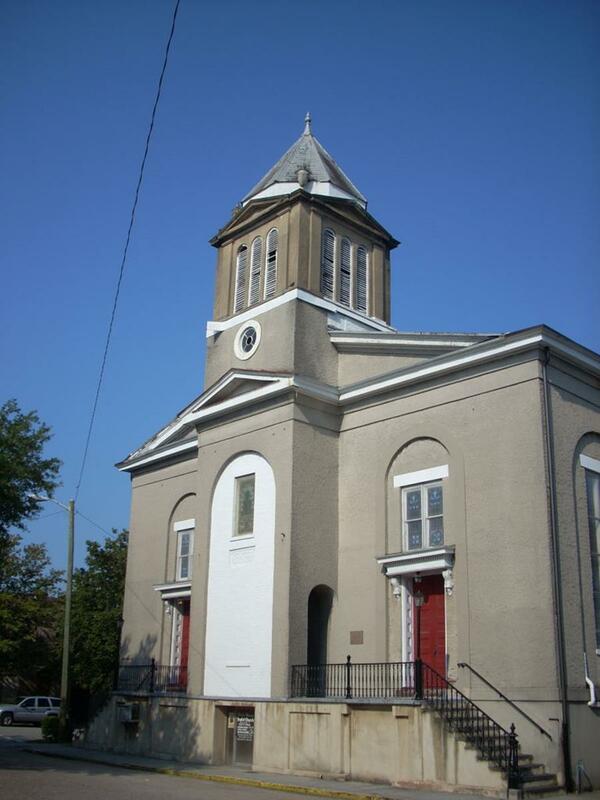 The First African Baptist Church is the nation’s oldest African-American Baptist church. The church was built in 1859-1861 by members of the congregation, most of whom were slaves. The church contains stained-glass windows illustrating George Liele, the founder and first pastor. The original lectern and pews (carved with African symbols) still remain. A museum connected to the church features archives and memorabilia. Savannah’s Christ Church was established by Oglethorpe as the city’s first church. It is built in the Greek Revival style with Corinthian columns and pilasters. The church has known different rectors, among them John Wesley, the founder of Methodism. Wesley served in the church from 1736-1737 and it’s where he published a “Collection of Psalms and Hymns,” which would become the first hymnal in America. 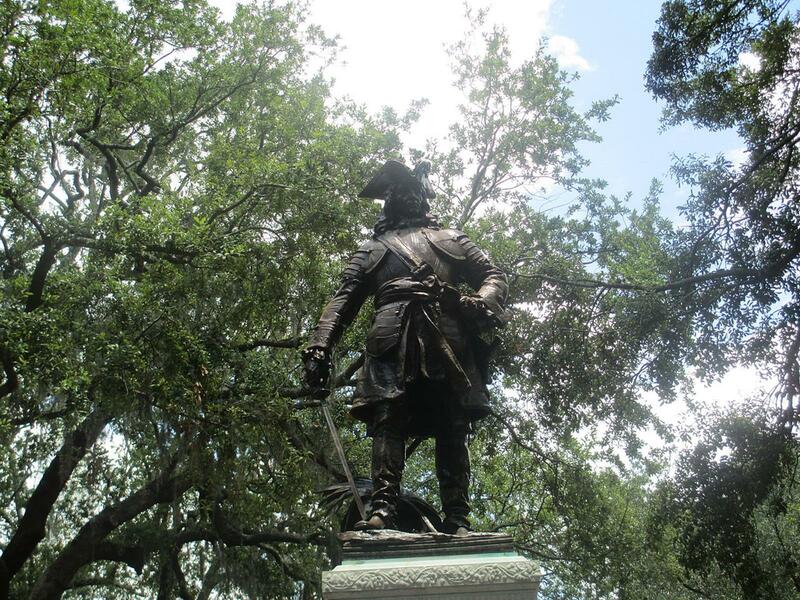 When built by Oglethorpe, Savannah was the first planned city in America. Oglethorpe laid the city out in a series of grids that provided wide streets and numerous public parks and squares. Such elements are still present, as 22 of the original 24 squares remain. 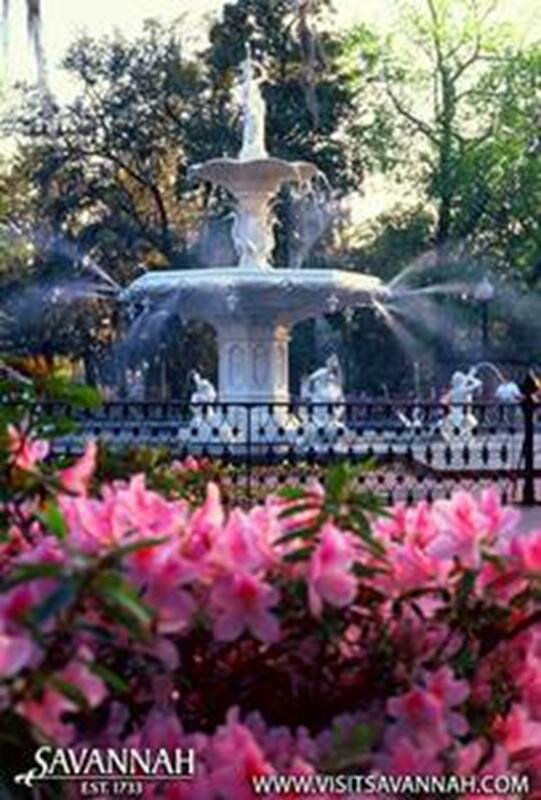 One of Savannah’s most viewed icons is the cast iron fountain in Forsyth Park built in 1858. Forsyth Park consists of a 30-acre area in the Historic District of downtown. Apart from the fountain, park encompasses walking paths, play areas for children and a Fragrant Garden. Savannah’s Historic District, contains the City Market, a four-blocks, open-air market that is the center of Savannah’s vibrant art scene. The Isaiah Davenport House Museum, built in 1820, and Harper-Folkes House, a Greek Revival mansion built in 1842, are also available for tours. Other museums in the district include the Ships of the Sea Maritime Museum, Owens Thomas House and the Telfair Museums. Outside Savannah is Tybee Island, providing beautiful beaches and scenery and the Tybee Island Marine Science Center, which offers classes and group programs. Another must-see on Tybee is the 18th century Tybee Island Lighthouse still in operation. Another way to see the city is through Old Town Trolley Tours of Savannah. Take a trolley ride while listening to humorous tales and fun facts from conductor guides. Savannah Riverboat Cruises tour the riverfront offering brunch and dinner cruises with live entertainment and local cuisine. Outside the city, tours are available through Wilderness Southeast Nature Tours. Options include walking, paddling or boating to wildlife habitat such as beaches, rivers and marshes. All tours are led by expert naturalist guides. Georgia’s largest musical arts event is the Savannah Music Festival at the end of March through April. It is a world-class celebration of music covering an eclectic mix of genres from bluegrass to gospel. Forsyth Park is home to an annual Saint Patrick’s Day celebration. It began in 1813 by honoring the death of the city’s patron saint, Saint Patrick. The tradition continues, featuring two weeks of religious and cultural celebrations. Events include the greening of the Forsyth fountain and mass held at the Cathedral of Saint John the Baptist. Free activities for every age and interest can be found at the annual Savannah Black Heritage Festival in February. Music, dance, cultural education, ethnic cuisine and crafts are featured. History is found on every corner in Savannah. Churches, parks, houses and museums are scattered throughout the city along with rivers, islands and natural scenery. Savannah provides an excellent atmosphere for religious groups wanting to explore the history of Georgia’s largest port town and home of Southern hospitality. Located on the banks of the Mississippi River is Minneapolis, Minnesota’s largest city. The name Minneapolis originated from the city’s first school teacher, who combined the word mni, the Dakota word for water and polis, the Greek word for city. Today it is referred to as the “City of Lakes” because of the 22 lakes in Minneapolis. 10 Top Catholic Shrines in the U.S.